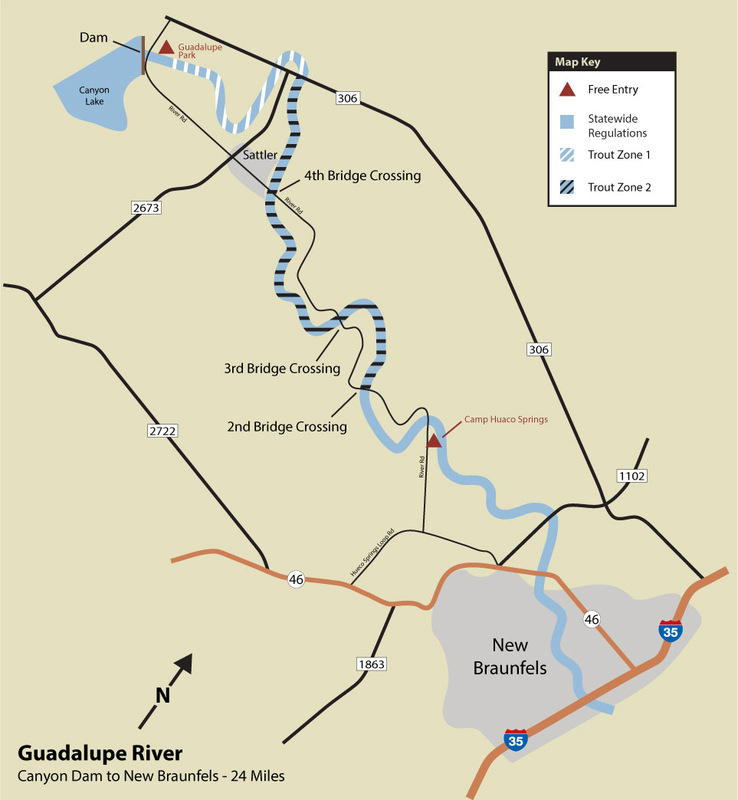 The map on this page shows the trout fishing area of the Guadalupe River between the Canyon Lake dam and the City of New Braunfels. Trout will be stocked at Guadalupe Park, Whitewater Camp, 4th Crossing, 3rd Crossing, and Camp Huaco Springs. December 7, 2018 – March 7, 2019, except weekend of February 22-24: Free access available for trout anglers at Camp Huaco Springs. Anglers at leased areas have free access to the river from 30 minutes before daylight until 30 minutes after dusk. They may use the properties for bank fishing and to launch non-motorized watercraft such as rafts, kayaks and canoes for the purpose of fishing. These leases were made possible with grant funding provided by the U.S. Department of Agriculture’s Voluntary Public Access and Habitat Incentive Program. Beginning 800 yards downstream from the Canyon Dam release gate and extending to the easternmost bridge on FM Road 306, there is a 12-to-18-inch slot limit. Trout 12 inches and under or 18 inches and longer may be retained. Daily bag limit is five trout, and only one can be 18 inches or longer. From the easternmost bridge on FM 306 downstream to the second bridge crossing on River Road, there is an 18-inch minimum size limit, and a one trout daily bag.